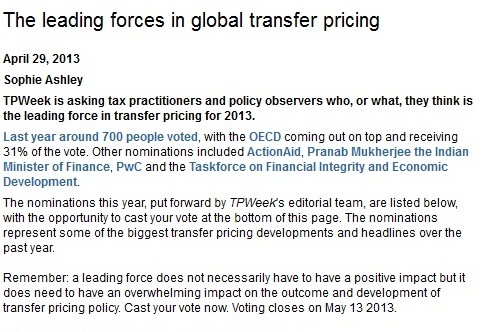 Tax Justice Network: Transfer pricing: vote TJN! 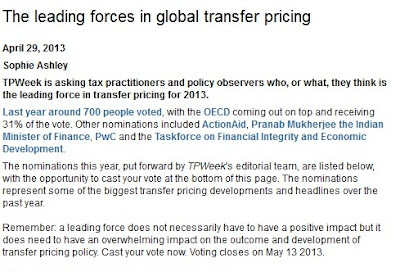 "Thus far, the problem (of tax avoidance) has been delegated to the OECD, which is seeking to tighten rules on transfer pricing... But it is questionable whether a few tweaks will be enought to stop multinationals from making corporation tax liabilities evaporate, and countries from competing to offer tax loopholes to footloose multinationals.... The most ambitious solution would be to agree a common consolidated corporate tax base. This would have states tax a mutually agreed share of a multinational's proftis, not just the share the group decides to account for in each jurisdiction." We are not alone in arguing that this is the logical direction of travel for corporate taxation. Rather than spend endless years of committee time trying to stitch Humpty-Dumpty (a.k.a. the arm's length method) into a half workable model, now is the time to strike out in a new direction fit for the 21st century. Don't delay; vote now for TJN. You know it makes sense.